With ultra thin absorption core, light but with high absorbency. Absorb the urine very quickly, keep baby’s bum dry all the time. 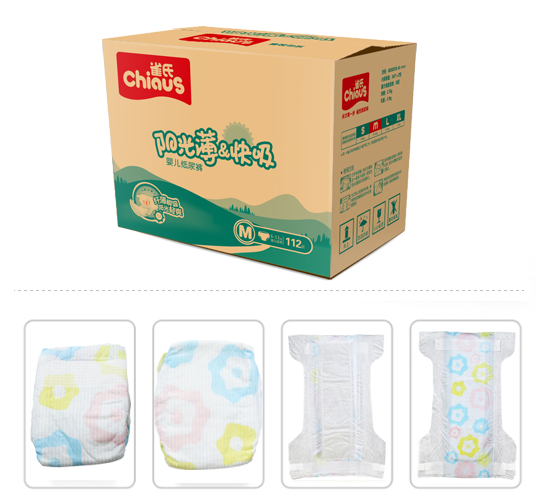 With high quality and high gram of improted SAP from Japan and Germany, ensure the quick and high absorption of urine, and bring long time dryness for the baby. Wetness Indicator: Helps to remind moms to change the diaper for the baby in time. The yellow lines on the back sheet turn green once the diaper is full. 3D Leaking Guards: Snug leaking guards fit baby’s body well and prevent leakage when baby moves. 180° elastic waist band fits the baby’s body better, bring supreme comfort for the baby.